The social media is an avid platform to share data and interact with people. Today most of blogs and websites communicate through the general audience using written articles and media including images and videos. Images are an effective way to reach the masses as they are forty times more likely to get shared on social media. Stencil is one of the best tools for creating visual contents. It is a fast and an easy to use a platform. It can be utilized either through an in-page app or by installing a Stencil extension for Google Chrome. By using the Chrome extension, you can highlight text anywhere or simply right-click images on the Internet to create great visuals. Simply login into the web app and you will see a dashboard similar to the above one. 1. Easy to Set Image Size- One can always change the canvas size. You can use one of the previously provided presets. 2. 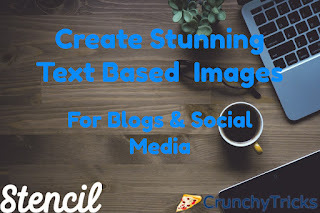 Add Texts to Images - Adding texts get as easy as double clicking anywhere and typing it. 3. Save the picture; you can then download the image or preview it and take reviews from friends and others. 4. Apart from the given backgrounds, one can also upload backgrounds. And perform all the above operations, including texts. 5. You can use various filters like black and white, sepia, darken or lighten the image. 6. You can also keep colored backgrounds. Multiple colors can be chosen. These present elegant and eloquent visual images. 7. The app also helps one to create logos, watermarks, and templates. Creating icons are easy just find the correct icon a per your requirement. Add the text of your organization or whichever way you want the logo to appear and use it freely. 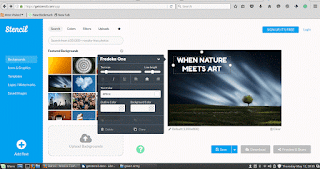 There are some featured templates available, and templates can also be uploaded through the system. This provides the users with a great variety of options for their posters. The website allows you to make images at a breakneck pace. It also marks the experience accessible and entertaining. Adding texts merely requires a double click and the font formatting can be easily done with a few clicks. The icons can be created with some motion of the mouse pointer. The best part of the organization is that keeps constantly improving, always amazes its customers with new and better stuff. 4. By installing the Chrome browser, you can access multiple other features like – Highlighting text anywhere if you read a quote, and you want to know if there was an image about that. Just highlight that text and create an image about it anywhere. 5. To add text to a picture using a Chrome extension just right click on it and start typing your text. The Chrome store rating is about 4.5 star, and there are thousands of happy customers on the Chrome web store. 6. The site provides over 630,000 incredible public domain stock photos ready to use, at your fingertips. All these are photos are at super-high resolution and are ready to use. 7. One can easily save their favorite photographs and have a look them anytime and anywhere. Photos can be used for any purpose including personal or commercial needs with providing any prior attribution. 9. 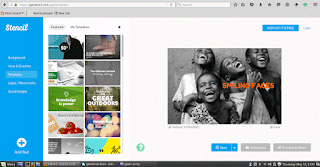 Pixabay powers the site, and all the photos available are safe to open and use. 10. You can get perfect sizes for whichever image you are creating. There are around 34 presets that provide optimal sizes for social posts, ads, blog images and more are preloaded. And if you have a size in your mind you can easily customize that without any problem. 11. You can send live previews of you to work on any of the social sites - Facebook, Twitter, Pinterest, Instagram or Buffer. 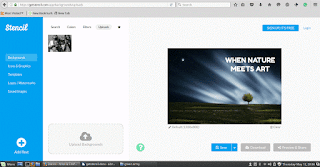 You can also schedule any image you have previously created using buffer within seconds. If you have a buffer account, you simply need to enter the time you wish to display the picture. Scheduling images will help you save lots of time. 12. Over 200,000 icons to choose from - The partnership with the Nuon project effectively bring out thousands of incredible icons created by world-class designers. They're all royalty-free & completely safe for you to use personally or commercially. The simple version is free of cost and allows you to create 10 photographs per month. The sign-up is free. But this allows limited backgrounds, limited icons and only 10 favorites in the database at a time. To explore more about the services one can easily choose the pro version just at 9$/ month it allows it's users to create unlimited images, with more than 630,000 options for background photos and more that 200,000 icons and graphics. One can keep unlimited images as favorites in the database and can access logo watermarks and more than 50 amazing templates. Provided with premium support all time. The best part of it is that the monthly plan can be canceled anytime, and you will also get a significant discount if you enroll for the yearly plan. In case you are dissatisfied with the services provided you can always opt out of it and will get you, money-bank guaranteed. This offer can be availed within seven days of creating the account. Another great deal provided by the websites that all the images and icons are royalty free and are licensed under an exclusive public domain named as CCO (Creative Commons license). So you can use any picture, symbol, template in you blogs, posts, posters anywhere. It has recently 30,000 active accounts and is helping each one of them in creating spectacular images. 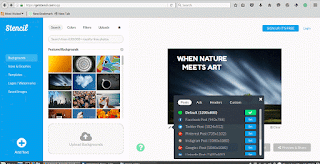 As remarked by Noah Kagan, the Founder of AppSumo or SumoMe it is one of the quickest, easiest and best platforms to prettify an image and is highly helpful. 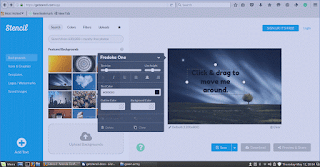 Use this application if you intend to create great visuals for any platform. It is super easy and exciting. I hope you will have a great time using this app just like us.